This Post Is About The Third Stage In Using Magic. Each Stage Is Outlined In Introduction To Magic. The first stage Is Choosing Your Purpose and the second stage is Choosing your Correspondences. Looking at the purpose and symbolism you’ve chosen you’ll want to choose materials. Materials allow your intent to be viewed in a physical way. Another way to think about this is bringing your intention down to earth. This can become overwhelming and complicated very quickly: there are literally thousands of materials to choose from. Your goal is to keep your working simple and convenient. Choose materials that harmonize with the purpose and symbolism you have in mind. There are plenty of resources to help you and after a while, with plenty of practice and hands-on experience you will master this process. There are some traditionally agreed upon associations for magical uses but don't allow yourself to become tied down to these. If you have had strong experiences that you associate with a certain material and it doesn't match what traditional text say, go with your own association. 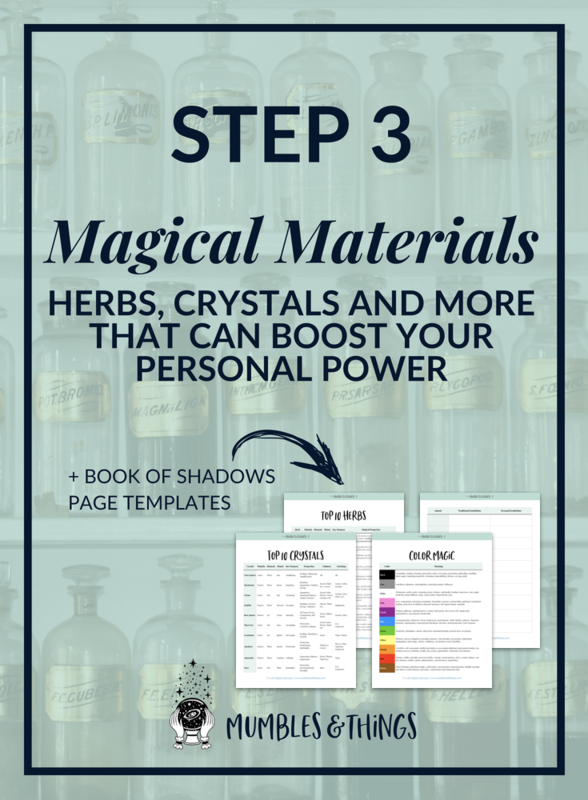 Your emotions and feelings are tied to your magic, the materials you use will enhance it. 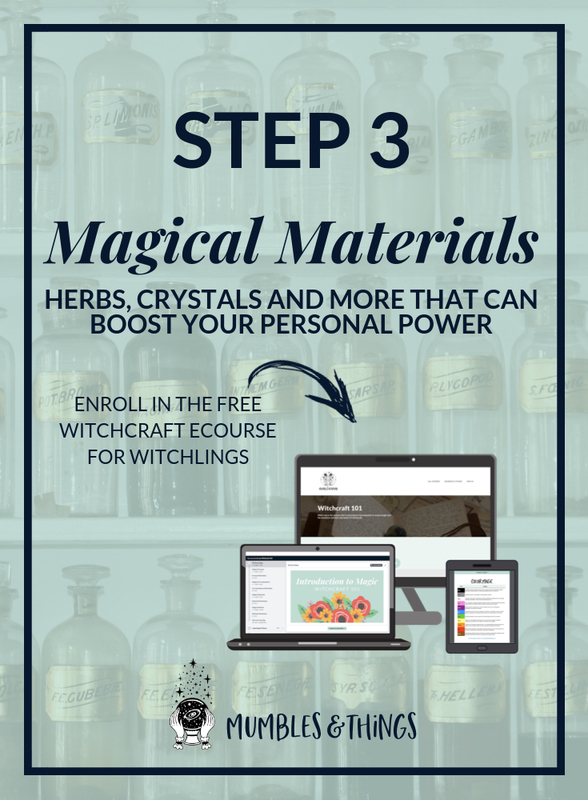 You can start with some of the traditional correspondences for these materials and as you practice you may find certain materials resonate differently for you. Be creative. There are so many types of plants in the world and each one could have it's own meaning and associations for magical use. On Tumblr I have been collecting various correspondences for plants from a variety of sources for years. These are the plants I couldn't live without: Sage, Lavender, Rose, Eucalyptus, Peppermint, Rosemary, Bergamot, Patchouli, Pine, and Basil. As with plants, there are countless crystals, some more well-known than others. And each one has a different purpose for magical use. I also have a collection of correspondences of crystals on Tumblr. I have already written about my top seven crystals for beginners, these include Clear Quartz, Amethyst, Rose Quartz, Citrine, Sodalite and Tigers Eye. Top make it an even 10 let's add Amazonite, Aventurine, Onyx, and Moonstone to the list. Just like crystals and plants, animals have their own magical associations. I won't get into any ethics of using animals in witchcraft here, but I will come back to environmental ethics at some point, so stay tuned. I myself use plastic figures of animals if I want to evoke their power in my magic. I have a list of correspondences of animals on my Tumblr page as well. Colors range from bright to dark, deep to light, pale to vibrant, regardless of their value or hue, colors affect us. They invoke different emotional responses and as such, they can be used in magic as well. The magic of colors can be used in many different ways, and the use of colors in magic is only limited by what you want to use the color for. Find color correspondences on my Tumblr page. You can also use symbols to represent something in your magic. Find the correspondences of symbols on my Tumblr page. Save your notes and add to them as you learn. You can print each page as many times as you need as your knowledge grows.